BOB D. CAMPBELL & CO.
To achieve the client’s vision of opening their flagship Messenger Coffee café and expanding the popular Ibis Bakery brand in the Crossroads Art District, this project involved the adaptive reuse of the 18,430-square-foot Kansas City Auburn Auto Company Building, which is listed in the National Register of Historic Buildings. Services included historic preservation, interior design and exterior architectural upgrades including window replacement. Original, historic elements of the 1911 building were carefully preserved and restored where possible. The design thoughtfully introduces new programming in a manner that restores the majority of the building’s original interior volumes. 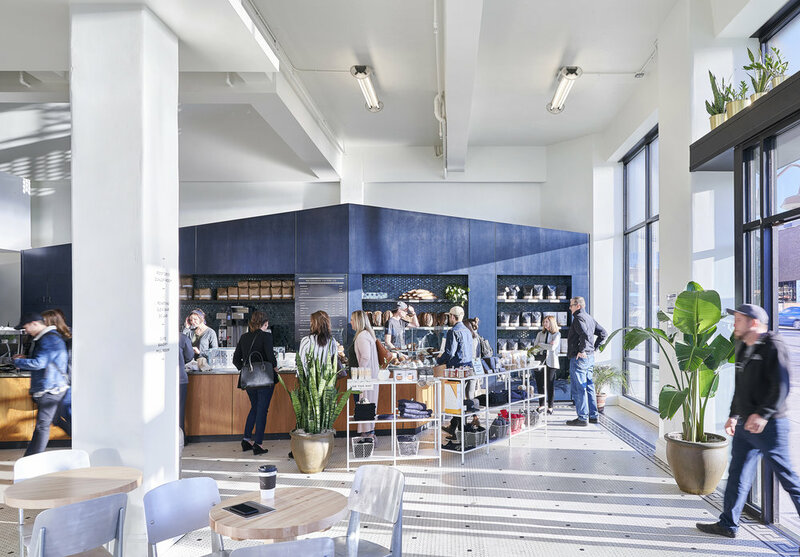 This programming includes a state-of-the-art roasting facility with green bean storage, flour mill, bakery, café experience, roof top gathering space, conference room, and administration office space for both resale and wholesale.